Most of my fellow 30-something friends have lost a love one in their lifetime - a grandparent, an aunt or uncle, a friend or even a sibling or parent. In my case, I've lost both parents and three grandparents. My husband lost his mother and sister and three grandparents. Planning our September 2009 wedding brought up a lot of old feelings of loss for both of us, so it was important for us to incorporate the memory of them into our wedding. We thought of incorporating a remembrance into the ceremony by lighting a candle or having a moment of silence. But we realized that one of the closest things on our guests minds would already be the absence of our parents and it would quickly turn a happy day into a sad one. Not to say that this wouldn't work for you, but we knew for us it would just be too hard. Maybe you haven't lost a family member, but there may be people who cannot be at your wedding that you want to honor. For us it was grandparents who were not well enough to travel. 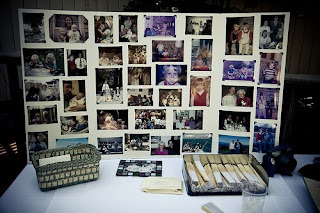 We ended up figuring out a way to honor both people who had died and people who could not be there by creating a photo board with family photos of all of these people. I put Dave's family on the right, and mine on the left and they mixed in the middle. People loved looking at the photos and reminiscing about the moments they captured. I also wore my grandmother's gold bracelet which my mom had worn at her wedding, which helped me feel close to her that day. Dave's grandmother called one of his uncle's cell phones and the phone was passed around between Dave and his aunts and uncles on that side of the family, effectively bringing the wedding to his grandmother. One of the big surprises at our wedding was a quilt made by 20+ of our friends and family members. Dave's step-mother found a pillow his mom had quilted and made it into a square for the quilt. My uncle copied one of my mother's paintings onto fabric and made that into a square. My aunt found a pillowcase that had been my grandmother's with her monogram and that became another square. With these subtle remembrances, our wedding honored those who had died and those who could not be with us while keeping the day happy and fun for everyone. What ideas do you have for honoring loved ones? This is so cool! We have a similar pla, but we're taking wedding photos from both our parents' and grandparents' weddings and having them blown up and displayed along a walkway in my grandma's garden (where we're getting married). I love the idea of honoring both living and deceased family members. My friends father was in the hospital for his wedding day so he phoned in a dinner prayer for the wedding. It was his way of staying connected and being a part of the day. We just held the cell phone up to the djs mic. At our wedding, we acknowledged those who could not be there physically but were with us in spirit, and asked for their blessings just as we asked for the blessings from the community before us. We also brought little framed photos of loved ones who had passed in a basket and placed it on a chair in the front row at the ceremony. It was more for our reassurance of remembering them than displaying the photos for the guests. I seem to remember, though, that they did get set up somewhere at the reception, as well. 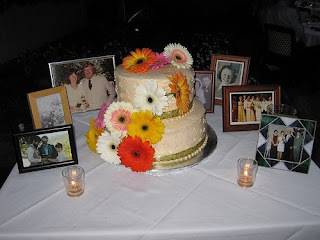 We had centerpieces made of (copies) of family wedding photos. Family members living and dead were represented in the photos from both sides of the family. It was a fun way to tie past to present, as well as serving as a great icebreaker.